On July 19, 2012 I had the pleasure of doing a Question and Answer session with Alison Klayman following an NBR screening of her first film Ai Weiwei: Never Sorry. She was open and generous in detailing how the film was made and how complex and challenging her two and a half year experience was – including the disruption of the editing process when she learned of Weiwei’s disappearance and detention. Alison Klayman has skillfully portrayed the life, art, activism and downright quirky nature of Ai Weiwei, China’s leading cultural provocateur. The filmmaker met the artist around the time of the controversy surrounding the building he co-designed, which became known as the “bird’s nest”, for the 2008 Olympics in Beijing. Beginning as a small documentary of an exhibition of Weiwei’s New York City photographs (he lived on New York’s turbulent Lower East Side from 1983 to 1991), she was soon accepted into the artist’s circle and continued to document him for the next two years. 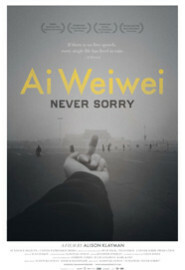 Ai Weiwei: Never Sorry is a well-told story about a man who is confrontational, controversial, and virtually unknown to many in the west. Ironically, the powerful hand of Chinese censorship means that he is even less-well known in China, at least among those not politically engaged. Weiwei’s life is a very unusual one and it is hard to think of a parallel in the west. His father, Ai Qing, was one of China’s most famous and influential poets, and Weiwei’s family enjoyed a life of privilege – until they fell afoul of the communist party. They were sent into exile in 1958 (a year after Weiwei’s birth) and forced into hard labor and other forms of “rehabilitation”, including the ritual humiliations that were cast upon the intellectual class, during Mao Tse-tung’s Cultural Revolution. The family was finally able to return to Beijing after Mao’s death in 1976 and Weiwei, not yet 20 years old, began to imagine a life for himself as an artist. After living in New York City’s East Village from 1981 to 1993, Weiwei returned to Beijing to be with his ailing father and began to question – and act upon – the challenge of being an experimental artist in the “New China”. Klayman’s two years with Weiwei (and the year that has passed since the film’s conclusion) have been remarkably eventful – and she has documented and structured the events in a way that helps to guide the viewer through a number of complex social and political issues. The most basic and important question that the film addresses is “Who is Ai Weiwei and why should we care?” There is a temptation, supported by the publicity seeking nature of the entertainment industry, to assume that famous artists/actors/directors etc. are not really in touch with political social issues – and that when they make waves (Charlie Sheen, Mel Gibson, Lindsey Lohan) it’s simply that all publicity is good publicity. Enter the son of a famous poet in China challenging government policies and it is easy to suspect that someone is just making a name for himself to sell more artwork. Never Sorry investigates the nature of Weiwei’s character through his actions – and puts those actions into a cultural context that clarifies the issues between those who are trying to “do the right thing” and a government frightened of change. The film begins with an interview at Weiwei’s home and studio that illustrates his subtle and comical approach with a story about one of his many cats. Unlike every other cat that he has known, this one can open doors (we see it leap, pull down a handle, and leave the room). But Weiwei compares the cat to humans and points out that it does not close doors once they are opened. Is this a criticism of the cat for leaving the door open, or a commentary on how this benefits the other cats that come upon the open door and can make use of it? Like his work itself, the observation makes us wonder about intention, meaning, and the relationship of the individual (the cat) and society (the house). Early in the film two events are documented that took place before Klayman met Weiwei: his denouncement in 2007 of the Olympic Stadium that he designed (he is furious at the forced removal of Chinese citizens as the Olympics approach) and his response to the massive 2008 earthquake in Sichuan Province that killed over 5,000 school children. In each instance the artist could have accepted reality and taken his place in the rising economic stratosphere of the Chinese art market. Instead he pretty much ensures his own economic disaster by directly challenging the government. The earthquake exposed defective building practices (which became known as “tofu construction”) leading to the collapse of thousands of government buildings – including many schools. The government refused to give the names or numbers of the dead so Weiwei created an art project, with numerous volunteers, which began painstaking research to collect and catalog the names and birthrates of every dead student. Using her own interviews and clips from documentaries that Weiwei created, Klayman chronicles the degree that Weiwei will go, when pushed, to bring the truth to light. The free flow of information is central to Weiwei’s art and politics. He refers to chess as a model for his engagement with the government and states that one needs to “push” or nothing will happen. And he delights, it seems, in the process of making things happen. Returning to China after his time in New York, he creates a series of events and books that coalesce the nascent underground art scene in Beijing. He creates and participates in protests against the forced detention of citizens such as writer Liu Xiaobo and activist Tan Zuoren. But Weiwei’s most effective and antagonistic tool in his fight for open communication is his nearly obsessive use of social media to spread ideas and to connect with followers. He uses Twitter as a weapon of choice, telling his assistants after a confrontation with police that they should be tweeting, not talking. His faith in social media is almost child-like – and the effectiveness is heightened each time that the government steps in and tries to shut him down. The viewer wonders how Weiwei can get away with what he does when so many others are imprisoned, harassed and even killed. The truth, of course, is that nobody is immune to the whims of a truly repressive government – and this is made clear by the escalating tactics used against him. The film brings us to the point where the government finally cracks down and then follows the confusion and aftermath of their aggressive tactics. Even when it seems that Weiwei is finally safe his punishment continues. He lived under house arrest, lost his freedom to use social media and to meet with journalists and to travel, and today faces a multimillion dollar penalty that is meant to intimidate and silence him. Alison Klayman has made a fascinating film about a man who refuses to let the truth be hidden. He is hardly a model citizen, as he admits, attempting to explain the circumstances of the son he had outside of his marriage. But this refusal to be normal is a big part of Weiwei’s attraction. Instead of resting on his laurels he chooses to shatter them like the Ming era vases that he painted with Coca Cola logos and smashed as an art project. China is changing and so are the Chinese people. Some, like Ai Weiwei, are changing much faster than the ruling party would like. This entry was posted in Film Reviews and tagged Ai Weiwei, Alison Klayman, Never Sorry by Thomas W. Campbell. Bookmark the permalink.